Lake Constance is a fascinating body of water at the corner of Central Europe – where the waters of Rhine River descend from the Swiss Alps. Its shoreline stretches to about 167 miles and is divided among Germany, Switzerland and Austria. 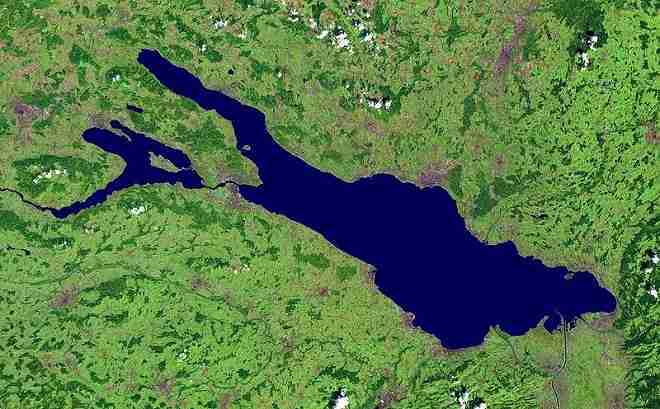 The German name for Lake Constance is Bodensee. Lake Constance has become a favorite family vacation destination in the region, and a hub for water activities. Lake Constance is the only area in Europe where no borders exist, because there is no legally binding agreement as to where the borders lie between Switzerland, Germany and Austria. Therefore the lake has to be considered not as common area, but as area which does not belong to any country. This area does not include the shore, but the lake outside the 25-meter isobath. Naturally, disputes arise. The different countries bordering the lake hold different views on where the borders are. These little territorial disputes do not affect visitors nor most people. The lake’s magnificent shores are teeming of vineyards, lovely towns, castles and baroque churches. 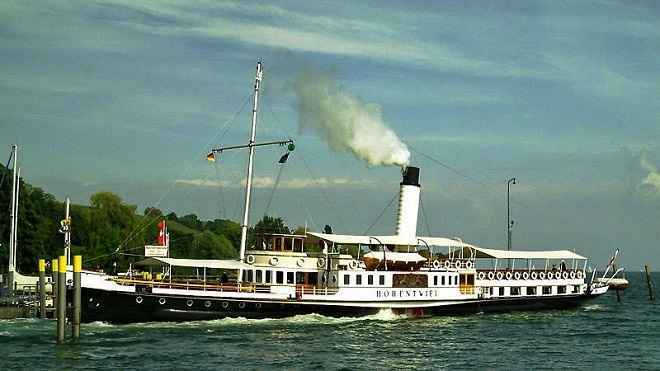 Going on boat tours that explore the towns surrounding the lake is a popular activity in the Constance Lake region. A cheaper option is to take public ferries that operate to and from these towns. In addition, organized networks of buses, cableways and trains make it easy and convenient for tourists to travel around the lake region. Since over half of Lake Constance appears to belong to Germany (this is questionable), most visitors begin their exploration of the river here. Contance Lake is named after Konstanz town; a vibrant university town with good shopping sections. Since the town is the unofficial capital of the region, numerous tourists use Konstanz as a base for traveling the lake region. The closest airport to the lake is situated in Germany’s Friedrichshafen town. Although this is more like an industrial town, it has some attractions worth visiting, like its picturesque promenade, the Schlosskirche dome and the Zeppelin Museum, which highlights the town’s airship history. Are you a fan of prehistoric events? If you are a fan of prehistoric events, then you should definitely drop by the town of Unteruhldingen. Here, you can find an open-air museum called Pfahlbauten, which features a collection of reconstructed lake residences which are based on remains that date back to the Stone and Bronze Age. For castle enthusiasts, the river town of the Meersburg is a must-stop. Meersburg is home to the Baroque Neues Schloss and Altes Schloss; two beautiful castle complexes nestled on a steep cliff facing the water. While in Unteruhldingen, make sure to catch the marvelous views of its waterfront street adorned with a string of interesting cafes. If your passion lies with understanding and enriching culture then head out to Bregenz town, a proud cultural center. Bregenz maintains an impressive contemporary art gallery. Its concert hall and huge floating stage become hosts to amazing operas and musical performances every summer. On the Switzerland side of the lake, one of the most notable towns is Kreuzlingen, which houses magnificent architectural medieval masterpieces like the St. Ulrich’s basilica and the Bernrain Chapel. Seeburg park is a great spot for the family to have a picnic and relax around nature. When you are exploring the Austrian portion of Lake Constance, make sure to include the old Roman Port and merchant town of Arbon in your itinerary list. You should also drop by St. Gallen, which is just a few miles south of Arbon. This town boasts a large decorated abbey library, which is listed as a World Heritage Site. Significant sections of Lake Constance are natural playgrounds where you can swim, canoe, windsurf or go sailing. Towns like Kressbron, Immenstaad, Wasserburg, Wallhausen offer all these activities and other themed excursions to their visitors. 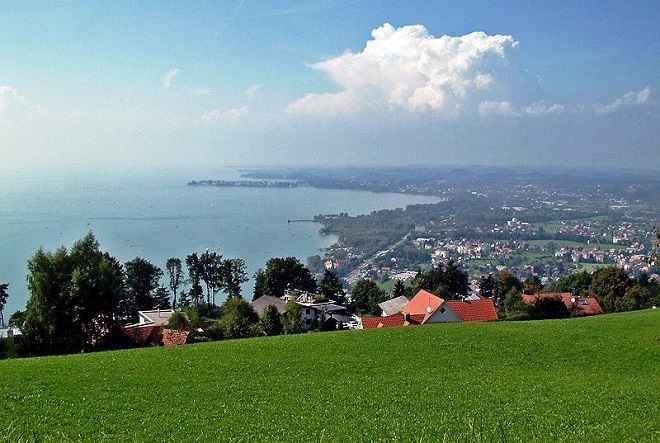 Aside from a number of sandy and pebbled beaches, Lake Constance also has three lovely islands, which include the Bavarian town of Lindau, the Flower Island of Mainau and Reichenau, a World Heritage Site. 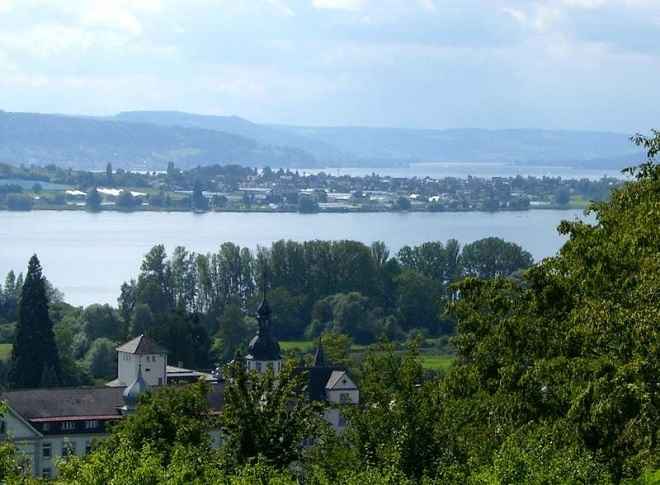 Reichenau Island was declared a World Heritage Site in 2000 because of its monastery, the Abbey of Reichenau. The abbey’s Münster is dedicated to the Virgin and Saint Mark. The famous artworks of Reichenau include the Ottonian murals of miracles of Christ in St Georg, unique survivals from the 10th century. The abbey’s bailiff was housed in a two-story stone building that was raised by two more stories of timber framing in the 14th century, one of the oldest timber-frame buildings in south Germany. Today the island is also famous for its vegetable farms. The Wollmatinger Ried next to the island is a big nature preserve, a wetland area of reeds which is used by many birds for the stopover during their annual migration. Reichenau Island was declared a World Heritage Site in 2000 because of its monastery, the Abbey of Reichenau. Mainau is maintained as a garden island and a model of excellent environmental practices. The island belongs to the Lennart Bernadotte-Stiftung or in English, the Lennart Bernadotte Foundation. It is one of the main tourist attractions of Lake Constance. Beside flowers there is a park landscape with views on the lake. There is also a greenhouse with tropical climate and thousands of butterflies. Mainau Bay is the location of the university sailing club. Mainau is a “flowering island” notable for its parks and gardens. The island as a whole contains about 30,000 rose bushes representing 1,200 varieties, and about 20,000 dahlias of 250 varieties. Lindau is a Bavarian town and an island on the eastern side of Lake Constance, the Bodensee. It is the capital of the Landkreis or rural district of Lindau. The historic city of Lindau is located on a small (0.26 sq mi) island which is connected with the mainland by a road bridge and the causeway of the railway to Lindau station. Lindau is located near the meeting point of the Austrian, German and Swiss borders. It nestles on the lake under Pfänder mountain. Lindau Island is popular with sightseers and holidaymakers for its medieval city center and pleasant location on Lake Constance. 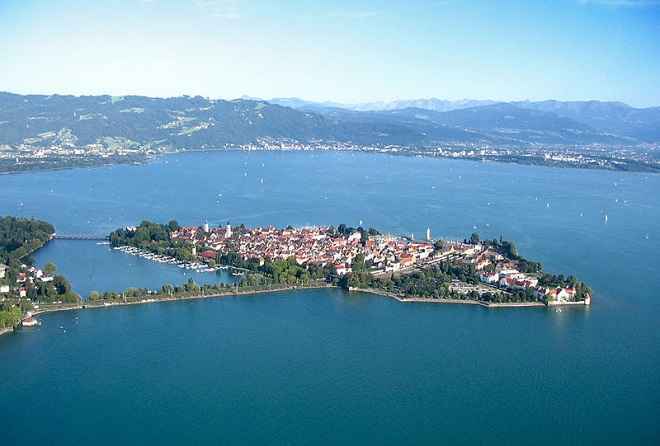 Since 1951, the Nobel Laureate Meetings at Lindau attract many Nobel prize winners to Lindau Island every year. A congress of medical physics is also held yearly. The casino owned by the state of Bavaria is a further attraction on the island. Take the quiz and let’s see how good you are in remembering what you just read. Lochau is a municipality in the Austrian state of Vorarlberg. It is located on Lake Constance, in the Bregenz district near the border to Germany. Photo by Böhringer Friedrich, CC-SA-3.0. Click image to enlarge. This Travel Quiz is about Lake Constance. This is a True or False quiz. The level of this quiz is easy. This test is timed (3 min) so be aware of that. Lake Constance is a place you should visit if you go to the area where it is located. It is unusual in that it is in three countries and there are no country boundaries within the lake. In a sense it is a no-mans land since it technically does not belong to any one of the countries. Occasionally this leads to disputes between countries. Thanks for taking this quiz about Lake Constance. Lake Constance (German: Bodensee) is the third biggest lake in Central Europe and offers, with its exclusive situation and the mild climate, exclusive conditions for relaxation and sport. 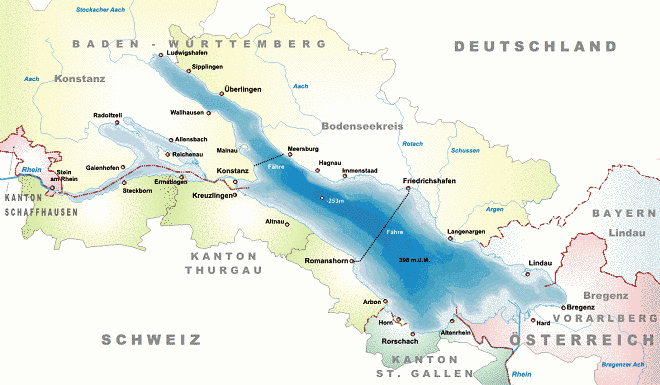 Four countries share the Lake Constance region: Germany, Austria, Liechtenstein and Switzerland. It is a lake on the Rhine at the northern foot of the Alps. The lake provides fresh water to many cities in south Germany. It was formed by the Rhine Glacier during the ice age. April, 2012. Filmed from Überlingen, Birnau (church) and Ludwigshafen. Sailing, swimming and cycling while admiring the Alps in the distance, or checking out the historic locations along the water’s edge: Lake Constance, crossed by the German, Austrian and Swiss borders, has it all. It has great appeal to both culture vultures and vacationers looking for some rest and relaxation. False – Lake Constance is a fascinating body of water at the corner of Central Europe – where the waters of Rhine River descend from the Swiss Alps. It is in Central Europe, not Eastern Europe. False – Its shoreline stretches to about 167 miles and is divided among Germany, Switzerland and Austria. True – Contance Lake is named after Konstanz town; a vibrant university town with good shopping sections. False – Lake Constance is the only area in Europe where no borders exist, because there is no legally binding agreement as to where the borders lie between Switzerland, Germany and Austria. Therefore the lake has to be considered not as common area, but as area which does not belong to any country. This area does not include the shore. False – Significant sections of Lake Constance are natural playgrounds where you can swim, canoe, windsurf or go sailing. False – Reichenau Island was declared a World Heritage Site in 2000 because of its monastery, the Abbey of Reichenau. True – When you are exploring the Austrian portion of Lake Constance, make sure to include the old Roman Port and merchant town of Arbon in your itinerary list. 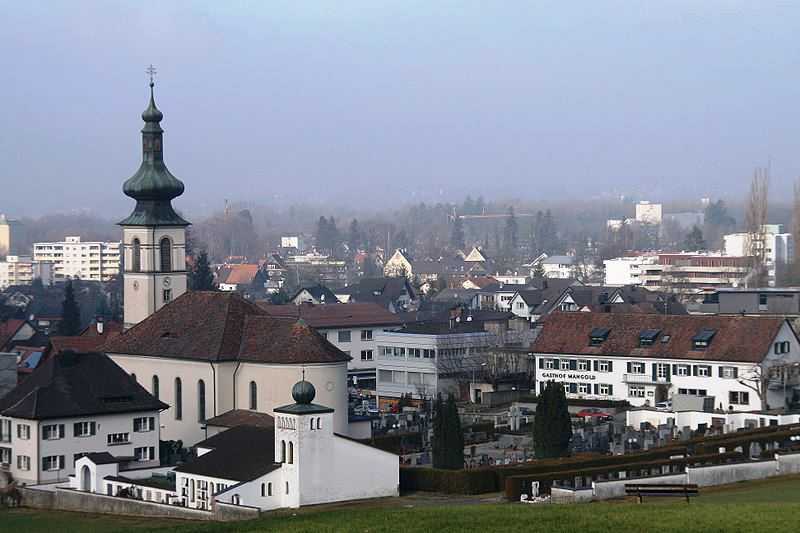 You should also drop by St. Gallen, which is just a few miles south of Arbon. This town boasts a large decorated abbey library, which is listed as a World Heritage Site. Austria, Germany, Lake Constance, Lindau, Mainau, Reichenau, Shoreline Towns, Switzerland. Bookmark.